Liliana Porter: Other Situations at El Museo del Barrio | The Bottom Line "The Drawing Center"
Liliana Porter: Other Situations at El Museo Del Barrio serves as a survey of the artist’s work from 1973 to the present. Organized between a chain of rooms that bounce between stark gallery and installation, the exhibition presents works from early in Porter’s career alongside newer, playful experiments with scale. Placed side by side, these works make clear the through lines in Porter’s practice. Reality and artifice and two and three dimensions interact to create scenes that encourage the viewer to reflect on their own relationship with the world and with their expectations towards various media. Image and object are similarly complicated by Porter’s work, which uses the familiar to warp viewer’s perceptions of reality. 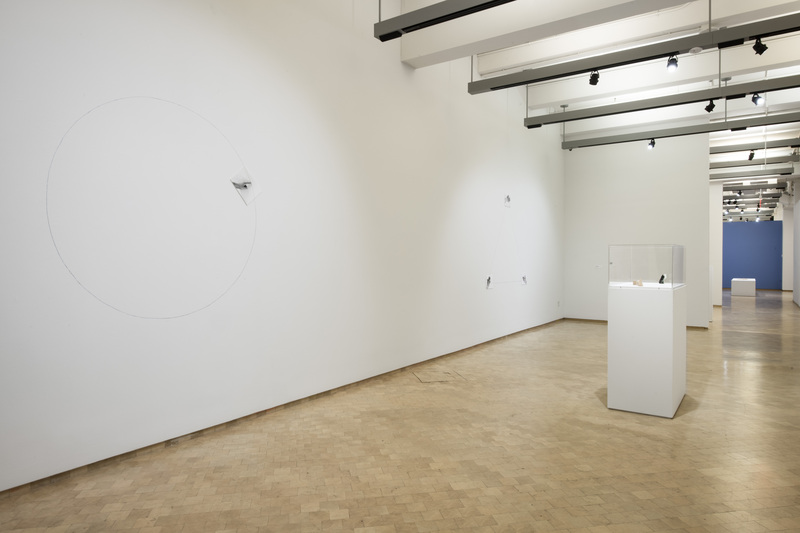 Installation view: Liliana Porter: Other Situations, El Museo del Barrio, New York. September 13, 2018 – January 27, 2019. Photo: Martin Seck. Though the New York Graphic Workshop ended in 1970, in the early 1970s Porter still produced work that coincided with the group’s goals. In Untitled (Circle Mural)[Sin título (Mural circular)], 1973–74, Porter continues a curving line photographed beneath a hand, inscribing a graphite circle several feet in diameter on the gallery wall extending from the photograph. Disposable and serial—the work has been reinstalled in El Museo del Barrio’s galleries after the 1973 original—Untitled (circle) also highlights the tangibility of a photograph and graphite by transforming them into elements in an assemblage. The drawing on the wall is more real and physical than the hand in the photograph, complicating viewer expectations of the physicality of the body and of two-dimensional artwork. The photograph gains weight and presence, casting a shadow on the wall and further flattening the curved line under the hand by comparison. Porter performs something of a magic trick, creating sculptural work from two dimensional images and marks by pushing and pulling the flatness of the subject. By the 1980s, the physical objects that Porter brought into her work migrated from the human body, often her own, to kitsch objects, including ceramic memorabilia commemorating heads of state and plastic soldiers. Photographing these figures, Porter introduces us to new simulacra of the human body. This time the copies are in the form of toys and sculptures, which are then processed through photography, becoming mimics of mimics. In a number of these primarily photographic works, including The Intruder [El Intruso], 2011, the addition of a physical object plays with this dance between reality and fiction. 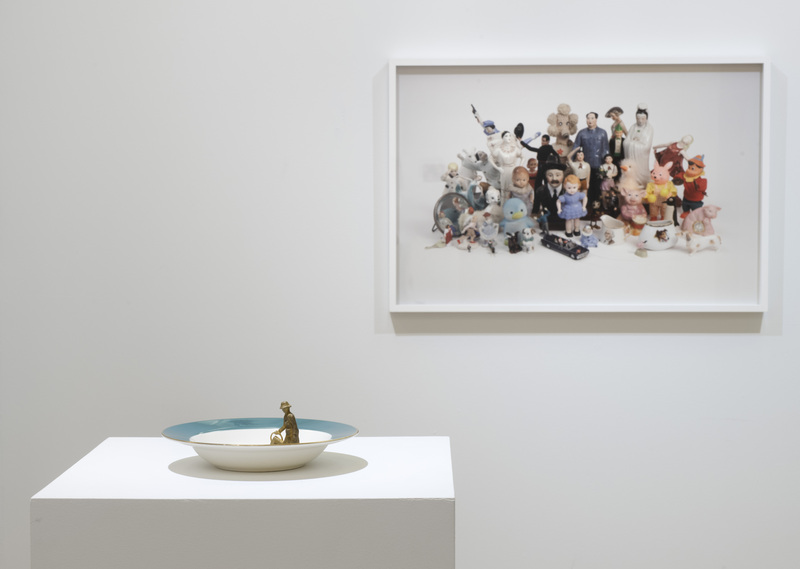 Porter attaches a figurine to the glass atop the photograph, camouflaging the sculptural element in a flattened crowd. The physical and the real yet again intermingle. Yet unlike in the earlier photographs of graphite and Porter’s own body parts, here the simplistic and even uncanny renderings of people both real and imagined make the artifice more obvious. Perhaps the most impactful (and certainly the most photogenic) works in the exhibition are the installations featuring tiny figures, each no more than 2 inches tall. These miniature figures now appear to make marks for Porter. 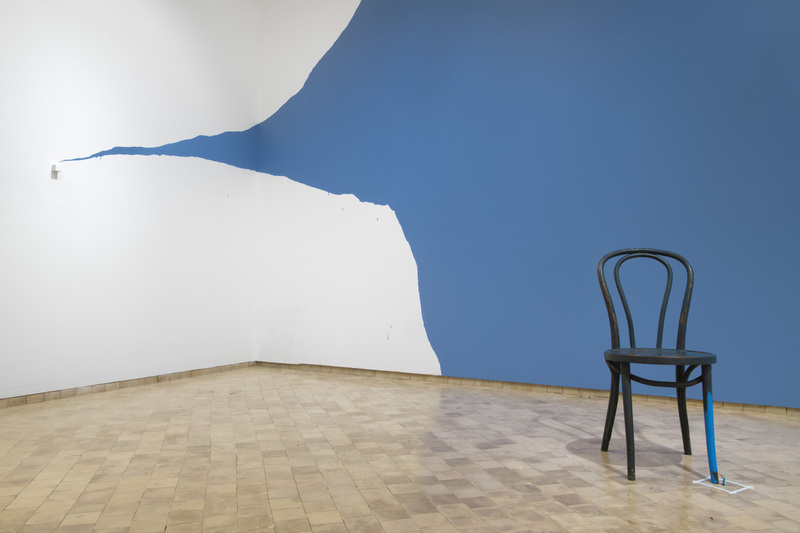 In the 2018 installation Man Painting [Hombre Pintado], a miniscule painter continues a monumental task: painting the Museo Del Barrio’s gallery walls a dusty blue. 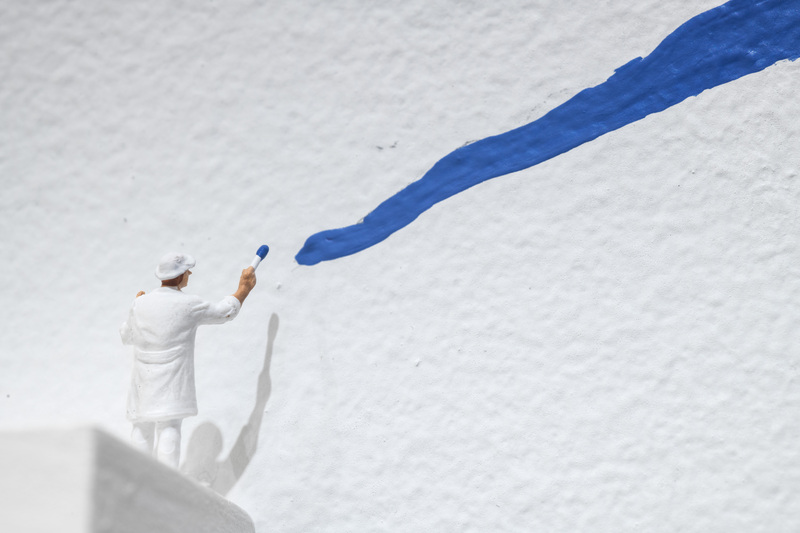 His progress acts as an arrow, tapering from the wall already covered to the painter’s raised hand, in which he holds a paint brush the size of a pen tip. Interspersed throughout the exhibition, figures like this, consistent in size, start to form their own Lilliputian reality. Viewers become giants and the artist a god, capable of crushing the figures or completing their daunting tasks in mere hours. Porter is the implied creator of these scenarios, but each tiny figure is the visible actor in the scene. Physical and temporal scale warp, making viewers acutely aware of how the work is made and at the same time ready to accept the fiction that the smaller figures introduce. We are forced to accept both scenarios as real, and to empathize with both artist and subject. Liliana Porter, Man Painting [Hombre pintado], 2018. Figurine on wooden cube and blue acrylic paint. Courtesy of the artist. Photo: Martin Seck. In some cases, as with Man with Pickaxe [Hombre con hacha], 2017, we see the minimal, formal concerns apparent in Porters early 1970s work remerge. She interferes with the gallery walls, and even the pedestals on which sculptures sit. The inch-tall man holding a hatchet stands atop one such platform. He is held aloft by the white box as we would expect of a sculpture. Yet he also appears to have carved into the intentionally innocuous structure, gouging and splintering the smooth white expanse on which he stands. This hatchet wielding figure has attacked his pedestal with blind rage, and, in doing so, has turned it into a part of the sculpture. By association, all the other platforms in the exhibition become sculptural elements, providing viewers with a chance to see them for what they are, a visual choice so familiar that it has become invisible. As with Man Painting and Untitled (circle), the architecture of the space is brought into the conversation, even as the artist maintains a cheeky sense of whimsy. In works like Untitled with Fallen Things [Sin título con cosas caidas], 2013, the kitschy miniatures that appear in Porter’s installations return to the canvas. From afar, these paint-globbed compositions have an abstract expressionist air. Porter drips, pours, and pushes paint around the canvas. However, she also introduces new dimension into the work, trapping chairs, wheels, horses, and even people in paint. Figurative individually, these miniatures pile and splay across the canvas as abstract marks on the surface. Porter underlines this tension between representation and reality. 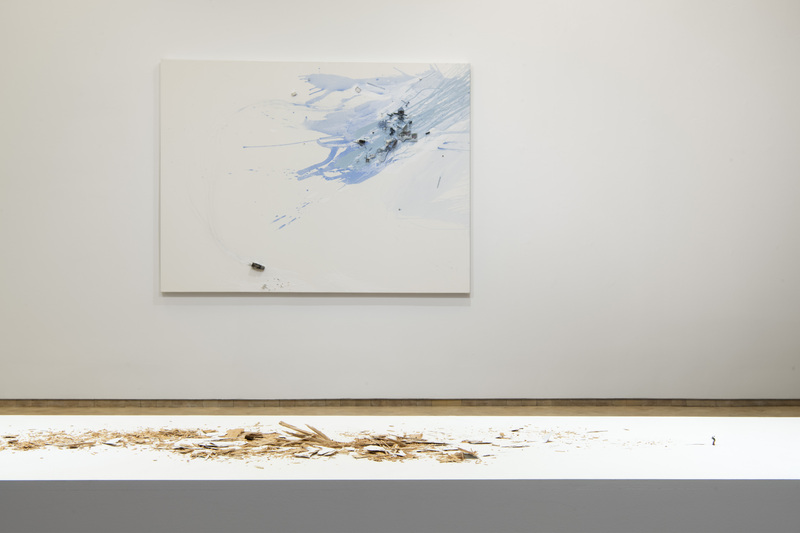 While the majority of the miniature objects in Untitled with Fallen Things lie scattered about, a miniature truck ploughs through the lower left portion of the work. Its wheels even leave tracks in the snow-like white paint. This simple truck forces the scene to alternate between aerial landscape and abstract assemblage, allowing Porter to bounce between an academic reflection on the canvas and a kitschy winter miniature. Thanks to a single truck, we see the fallen objects as both the carnage of an accident on the snow and a formal experiment with texture, pigment, and composition. For all Liliana Porter’s focus on messing with formal expectations, the exhibition remains whimsical and accessible. On my visit, adults and children alike marveled over the clever, surreal beauty of Porter’s images. Their appeal comes not because they are simple, but because they are smart. Porter knows how to use playful subjects to mess with the definitions that we accrue over our life-times: “What is painting?”, “What is drawing?”, “What is sculpture?”, “What is a gallery?”, and so on. Kids with the imagination to see a white painting as a field of snow, or the flowers on a porcelain plate as ready for a plastic gardener’s watering can are offered, by Porter, scenes that makes complete logical sense. Adults, so used to seeing the white canvas as minimal or abstract and the pedestal as a support, are forced by Porter’s work to enter the more childlike reality, to unlearn definitions and embrace the slippery nature of reality. Liliana Porter: Other Situations was curated by Humberto Moro, SCAD Curator of Exhibitions, and organized by SCAD Museum of Art. The exhibition is on view at El Museo del Barrio through January 27, 2019.